It Happened One Night…2nd Edition. This is the second version of this essay, the first one was destroyed when my blog had to be wiped as a result of being hacked, see the previous post for details. I did not keep a record of the images that I had placed in the previous version, so if you read the previous version and had a favorite image, and it is not here, please contact me and I will see what I can do about inserting it. 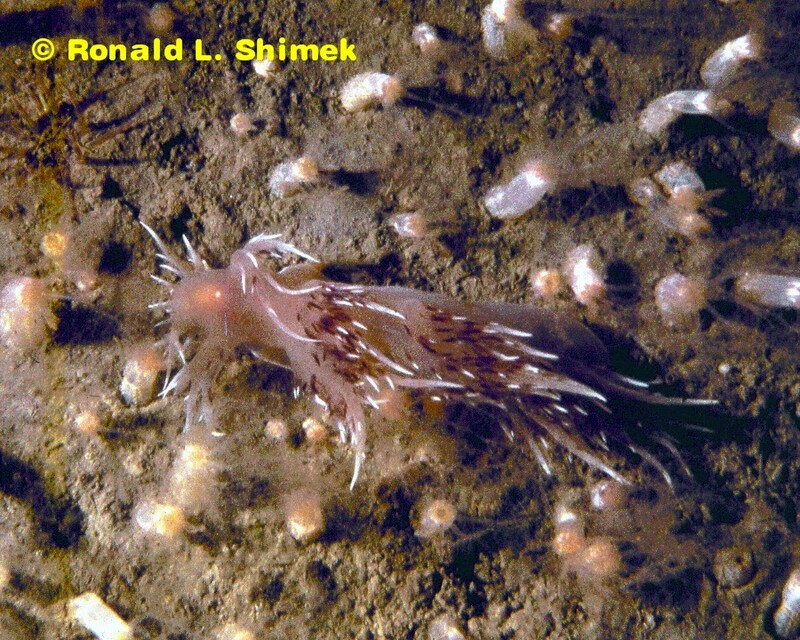 About 25 years ago I was teaching Marine Invertebrate Zoology at the Bamfield Marine Station (the name has been since changed to the Bamfield Marine Science Centre), a university-run marine teaching and research laboratory facility. This facility is located on the shores of Bamfield Inlet, a small embayment on the south side of Barkley Sound near the southwest corner of Vancouver Island. That particular year the course ran from late April until early June and was supposed to be a total immersion course – the students lived, breathed, ate, slept, and dreamed about invertebrates. In this year, by late May, I was casting around for something of special interest for the students to work on, something above and beyond the “standard” course offerings. 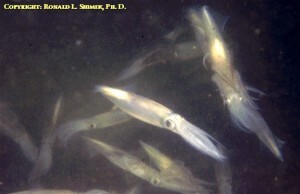 For about a week, we had been seeing a few squids swimming near the water’s surface next to the dock. This was unusual, so I decided to go diving and see if I could see what they were up to. 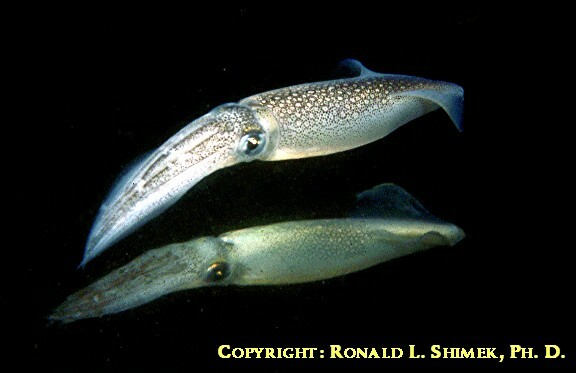 These animals were Loligo opalescens, the “Pacific Market Squid” harvested in huge numbers near Monterey, California for calamari. At the time, the southern populations were pretty well known, but not much was known about the northern populations. 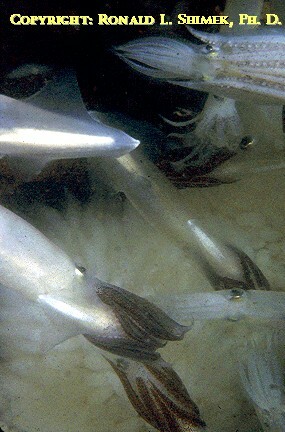 The local lore was that the squids, occasionally, would spawn in the inlet. If spawning was to occur, I thought it would be nice to document this for a couple of reasons. 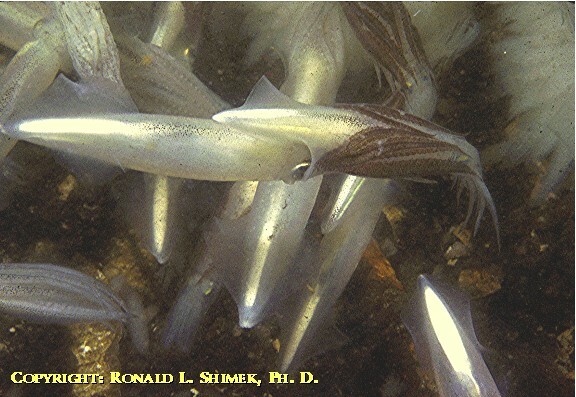 First – it would be ultimately cool to be in a squid spawning aggregation. Second – I thought I might get some nice images that I could use in lectures. 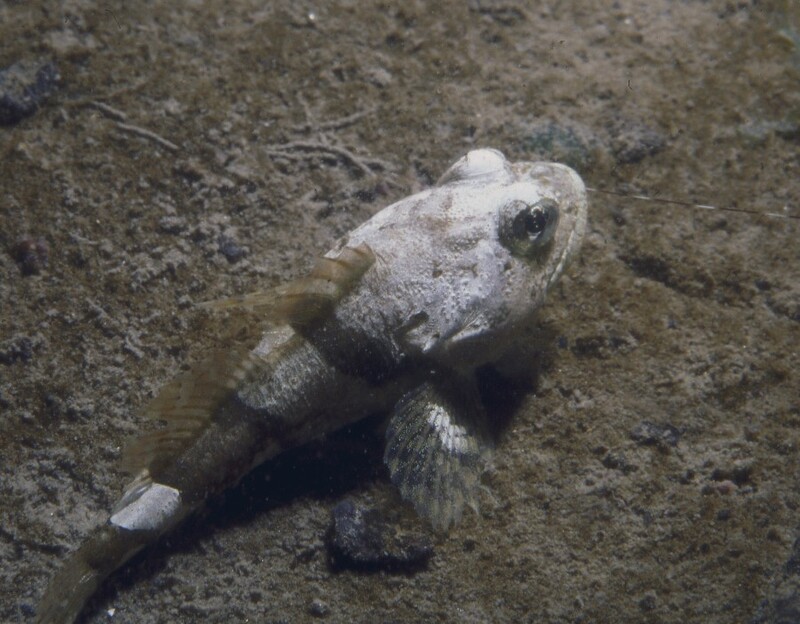 Third – I thought I might be able to interest a few of the students in doing some actual research on some small aspect of the spawning. All-in-all, if I could carry it off, it would be a win-win-win situation. The only problem was trying to predict when the animals would spawn, and then coming up with a scientifically valid short research project. Prior to this one particular morning, we had been seeing a few scattered squids near the surface in the inlet. 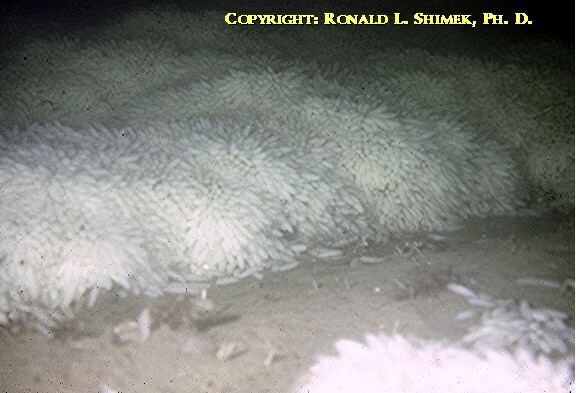 These surface-swimming animals were fully-grown, about 30 cm (1 foot) long, and bright white, so they were quite evident in the dark water of the inlet. 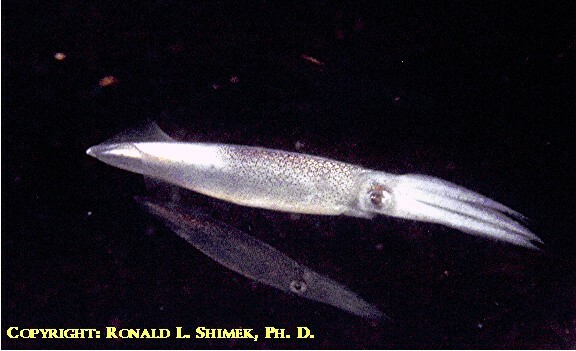 About 10 o’clock, after my lecture for the day was over, I wandered down to the dock, and noticed that the squids were present in larger than “normal” shoals, maybe up to 30 to 50 animals in each fast moving school, so I thought this would be worth a look. I asked around and found a dive partner and dock tender, and we plopped ourselves in the water about 30 minutes after 10 AM. To document our dive, I took along my underwater camera system, which consisted of an Olympus OM-2 in an Ikelite housing, with two strobes attached; one triggered by the camera and the other slaved to the first one. 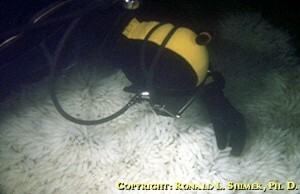 The film was Kodachrome-64, my film of choice for underwater photography. Dropping down to the bottom, at a depth of about 17m to 18 m (55-60 ft), we found a small mass of squids in a frenzy of activity. As a result, I started my personal frenzy of activity taking some images. 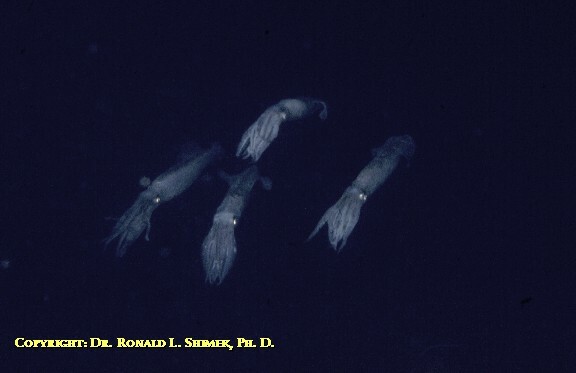 It soon became evident that a couple of individuals were spawning, but that most of the animals were just “interested” observers, squid voyeurs, I guess. 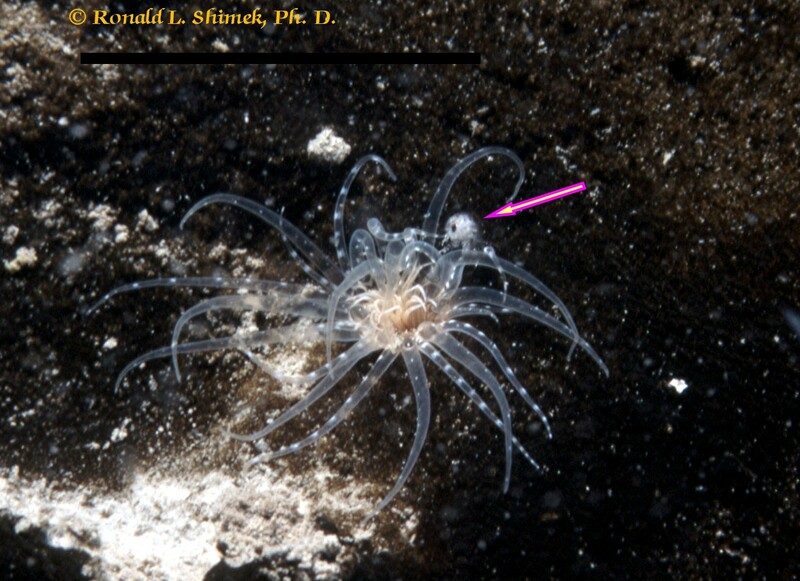 I documented a solitary female spawning and depositing her egg capsules. I presumed copulation had already taken place, as I saw no obvious mating activity. 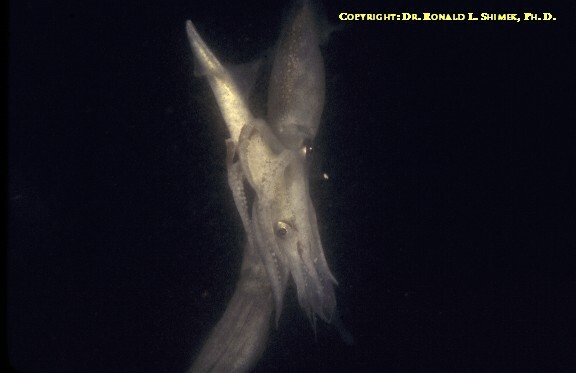 I had seen movies of some squid spawning aggregations, and it was obvious that what we were watching was not a normal spawning event. However, I thought it might be a precursor to the “real” action. Solitary Female Ovipositing. 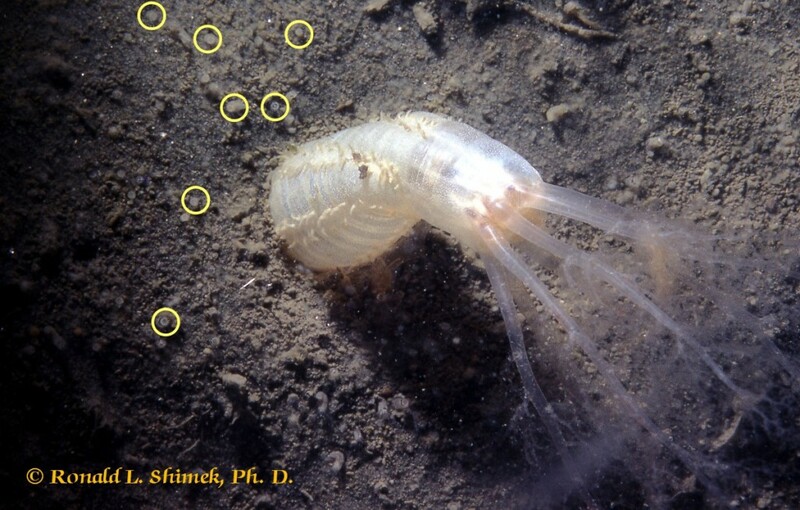 Note Egg Capsule Between Her Arms. 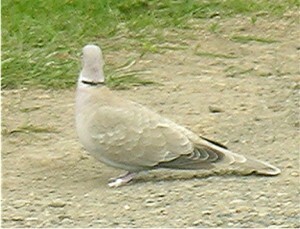 Same Individual As In The Previous Figure. Note The Egg Capsule. When we arrived at the scene, the fishermen already there said that jigging was “slow.” Squids were visible, but sparse, and not many had come into the area where the fishermen were. To avoid upsetting the fishermen, we dove well away from them. 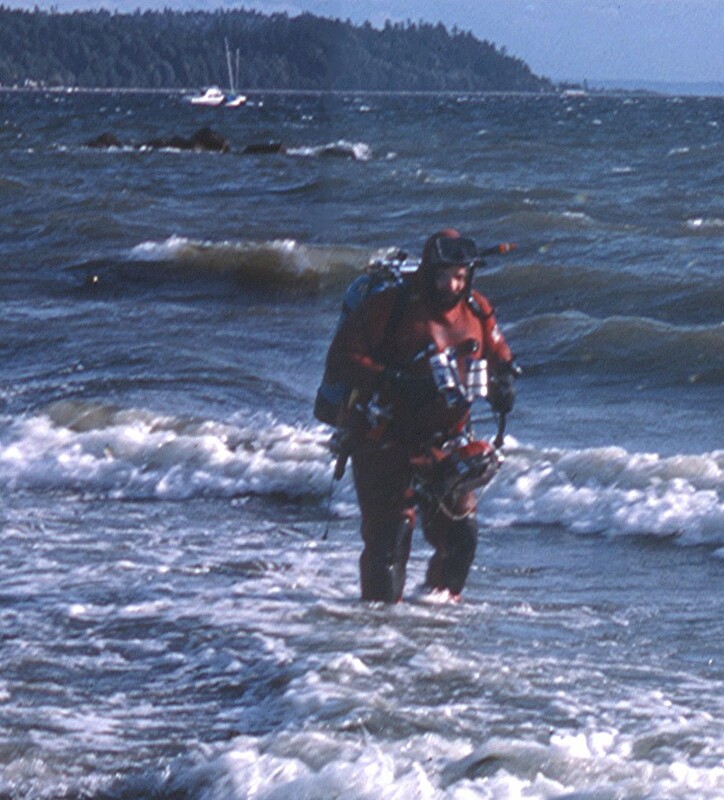 This also prevented us from being “jigged.” Having a sharp squid jig tear open and flood one’s (very) expensive dry suit can really ruin the experience of the moment! When we first got into the water, few Loligo were around, but within a couple of minutes they started to aggregate around us, probably attracted by our diving lights, and the large pile of rocks on the bottom nearby. At first there were just a few solitary individuals, then a few doublets, and then quartets, and then … large groups; Too large and too fast to count. All of a sudden the action began. 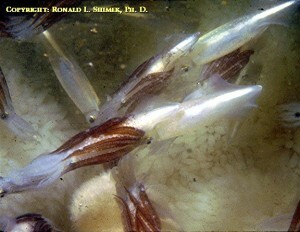 The animals approached the spawning site alone or in small groups of up to about ten individuals. 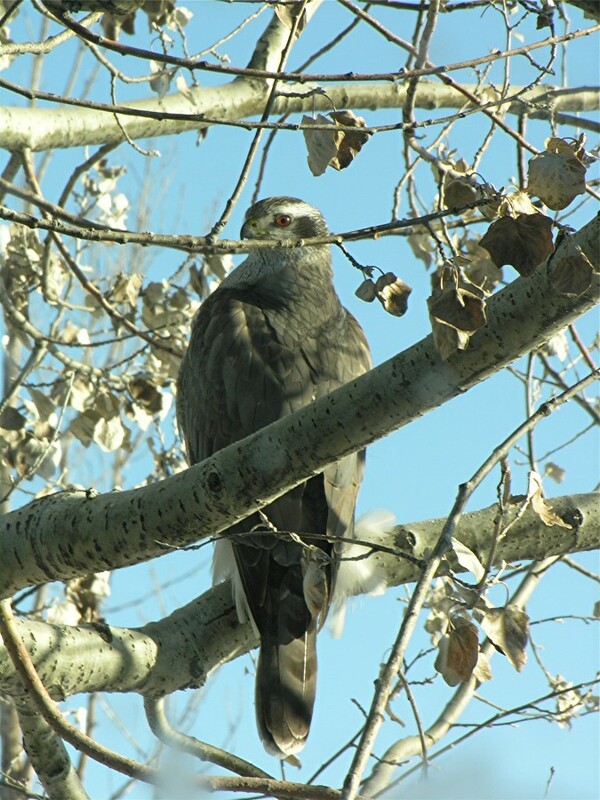 As they approached they had normal coloration; brown to reddish brown tones predominated on the bodies and the arms’ outer surfaces. A Quartet Of Squid Approaching The Spawning Site. 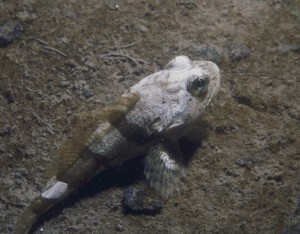 At the outermost region of the spawning site, about 5 to 6 m (15 to 20 feet) above it, the individuals were actively fighting with one another to find a mate. Females were “attacked” by males that wished to mate with them, and often two or more males fought each other for each female. This was a brutal, winner-take-all, competition! Skin was ripped off and the combatants used their beaks to rip pieces of flesh from their opponents. 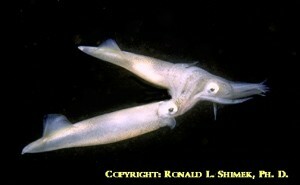 The females were NOT passive participants in this rough foreplay; they were actively fighting as well. Presumably, the strongest, most fit male prevailed. 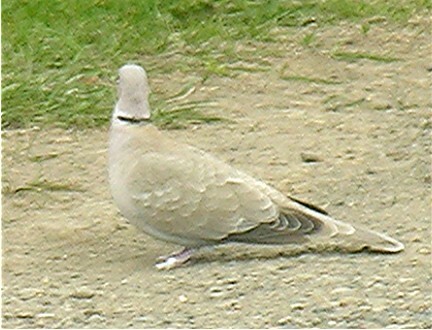 During this activity, both males and females were white. They did not flash or change colors. Mating/Foreplay Damage Making the mate choice - maybe... Lots of action here. Foreplay - but getting near the final choice of mates. Note the bite damage on the male (lower animal). As the combat continued, the participants got closer and closer to the bottom, and eventually one male prevailed. He got into the oviposition position; holding the female from behind and below, with his eight arms wrapped around her. Copulation, the transfer of a spermatophore (sperm packet) from the male to the female, occurred once this posture was stabilized. 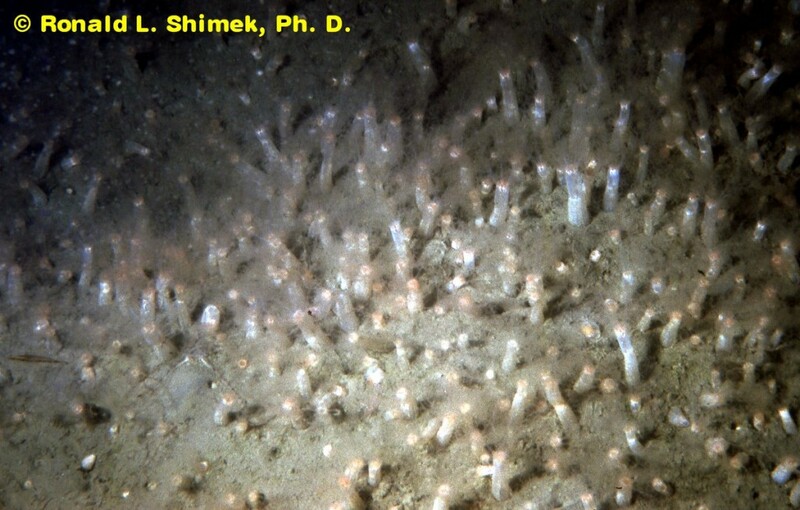 The animals were now about 3 m (10 feet) above the bottom. 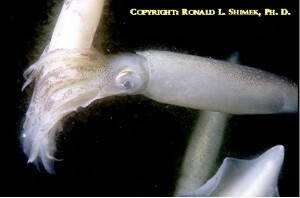 Once he was securely holding his mate, the male’s color pattern changed from pure white all over, to having a white body and reddish-brown tentacles. The female remained totally white. Once this color pattern was established all other males avoided the pair, and ceased jostling the resident male for possession of his female. I suspect the color pattern change was THE signal that mating had occurred and that this particular female was no longer available. 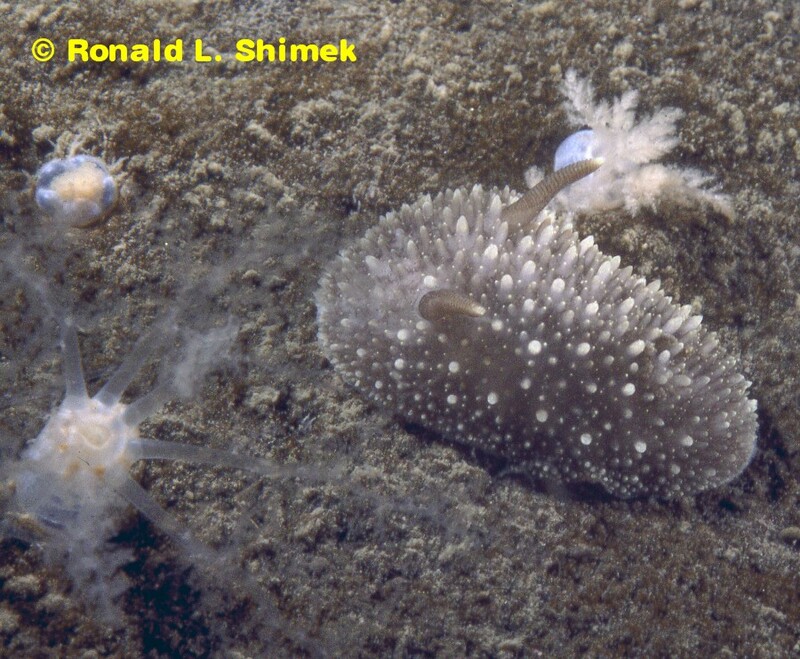 Mated Pairs Depositing Egg Capsules. After the male’s color changed, he did all of the subsequent swimming for the pair. He moved the female to the oviposition site and began to push her into the mass of egg capsules that were already at the site. 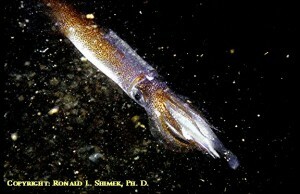 As they approached the site, the female extruded and formed an egg capsule which was held in her arms. Once the male pushed her into the egg capsule mass, or onto any other acceptable area, the female wrapped the distal, adhesive and ropelike, end of the egg capsule around anything, such as other egg capsules, a sunken twig, a rock, a diver’s mask strap, which would hold it in place. 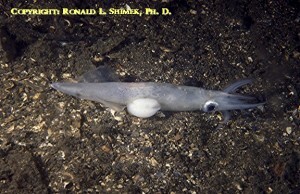 The egg deposition frenzy, overall there were hundreds of pairs of squid at this one small site. 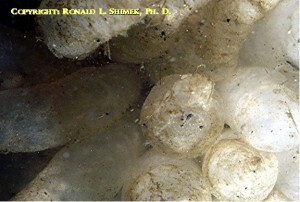 Spawning pairs and the main egg capsule mass. 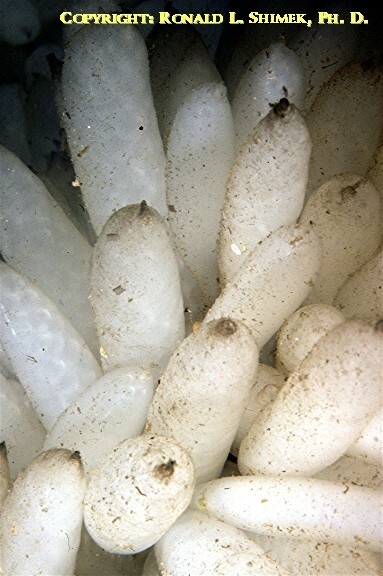 When first formed, these egg capsules were about the size of one’s little finger, but they became larger as they absorb water. 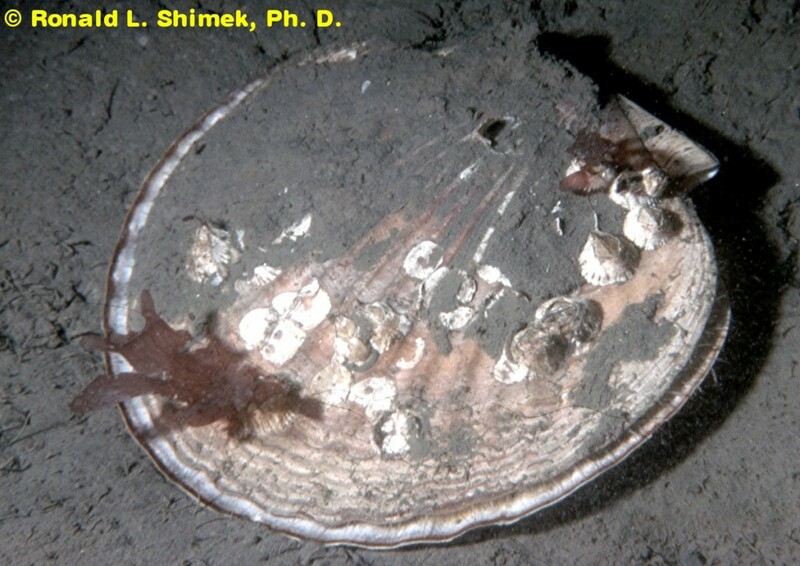 From subsequent studies, part of the project we later did, I found that each egg capsule in this region contained about 150 eggs, sequestered within a series of protective – and toxic – membranous coverings. I was unable to count the number of egg capsules produced by any specific single female, the situation was just too chaotic for that. 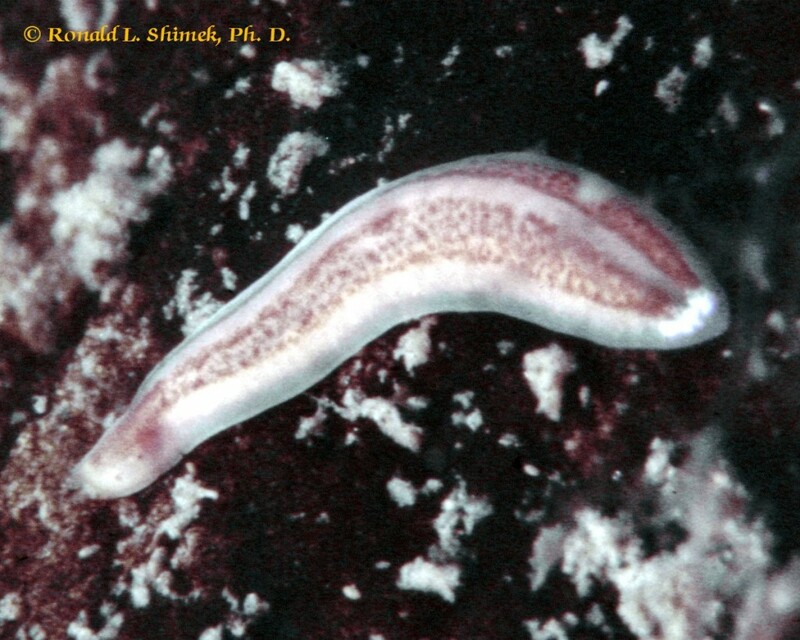 In the California areas other studies found that each female produced about 20 capsules. 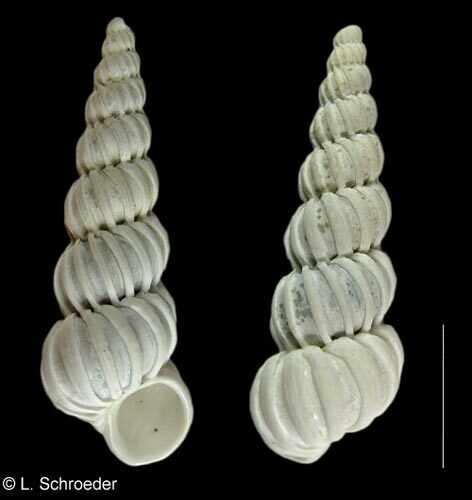 If the same number was produced by these northern Loligo, each female would deposit about 3000 eggs in her one night stand. Egg Masses The Day After Spawning. The Masses Are About A Meter Thick. 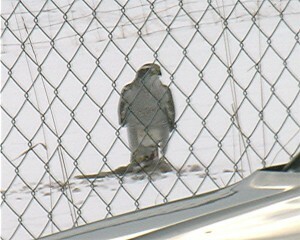 After the final capsule was deposited, the male released the female and they both slowly departed the area. 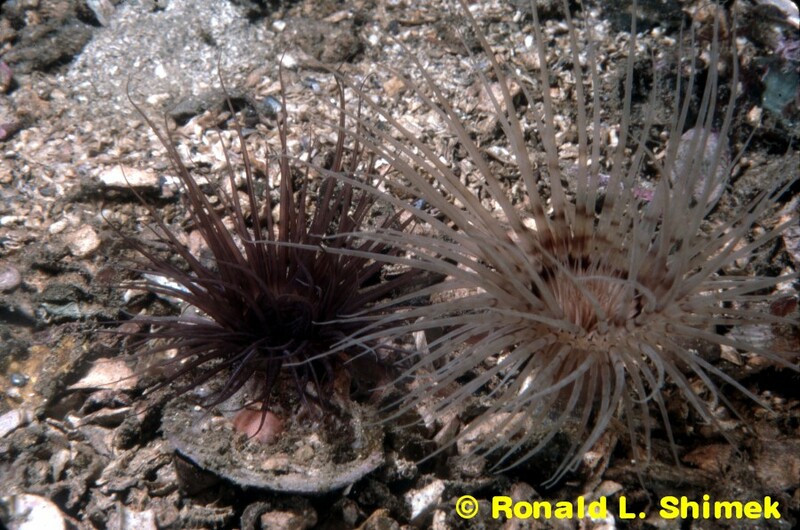 The males seemed to be a bit more active and I surmised that at least some of them might try to mate again, as each one produces numerous spermatophores, and they only use one per female. 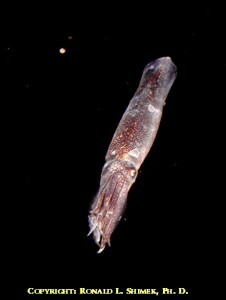 However, the action was so frenzied that I was unable to follow any given squid more than a few seconds, so it is possible that one shot was all the males had. The females appeared to be totally spent; they swam erratically and weakly. 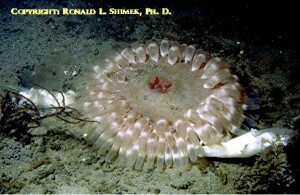 They often travelled only a short distance prior to settling to the bottom and dying. The males probably swam a few more hours, at best, but they, too, don’t survive long. Individuals of both genders are badly injured by the experience. 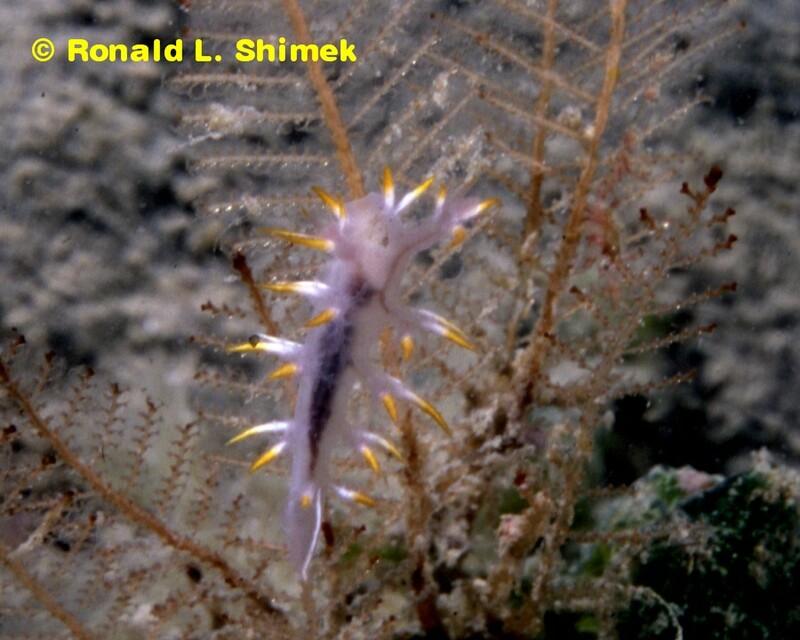 New Egg Capsules, The Day After Deposition, My Dive Partner For Scale. 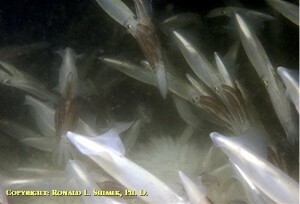 During the flurry of spawning activity predators made their appearance. In the area where I was diving these predators were seals and California sea lions which would come blasting through the spawning masses biting up squid as they went. Fortunately, they decided big ugly divers in rubber suits didn’t match their search image of calamari. 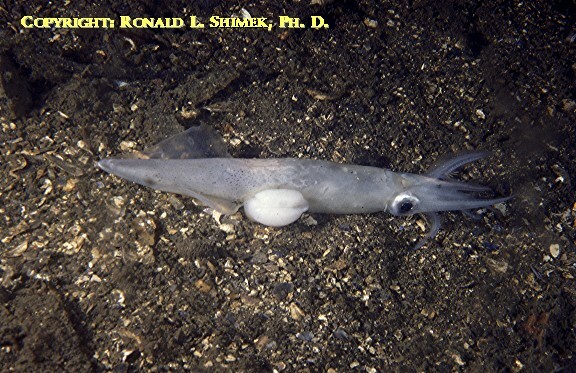 In other areas, larger sharks, such as blue sharks, will also come into the spawning squid schools, but, blissfully, I didn’t see any of those in the aggregations I dove in. After the spawning was over, the bottom was littered with egg capsule masses and dead or dying squid. Over the week following the spawning, some of my associates and students and I did some diving to make measurements of the squid egg masses. Scattered all over the bottom, from just below lowest low water to beyond diver depth, were small individual egg capsule aggregations. Each of these covered about 0.3 square meters, (about 3 square feet) and there were about 1.3 of them per square meter (10 square feet). I collected some of these aggregations, and found that each contained, on the average, about 1,940 capsules. 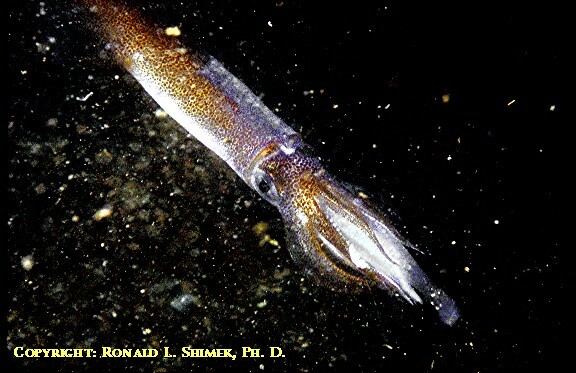 Each capsule contained about 150 eggs, meaning each capsule mass was the result of 194 squid pairs, and contained 291,000 eggs. Dead squid the morning after the spawning event. 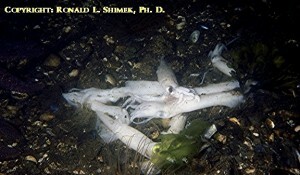 Mass of dead squid, the morning after. 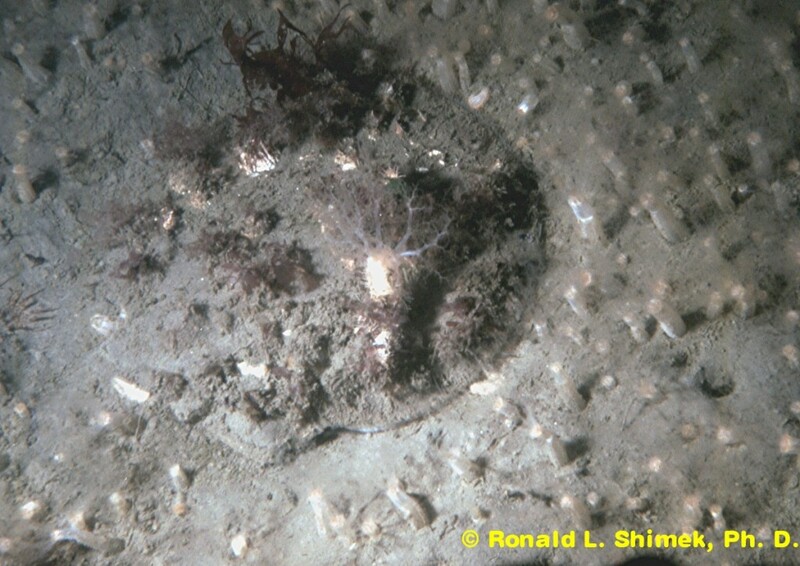 We did diving surveys to determine the extent of the night’s spawning activity. 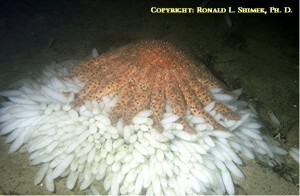 This particular night’s spawning aggregation extended along about 11 km (7 miles) of the southern edge of Barkley sound. The largest egg mass we found in a quantitative survey area was 69 square meters or 742 square feet, however, we saw some much larger egg masses. 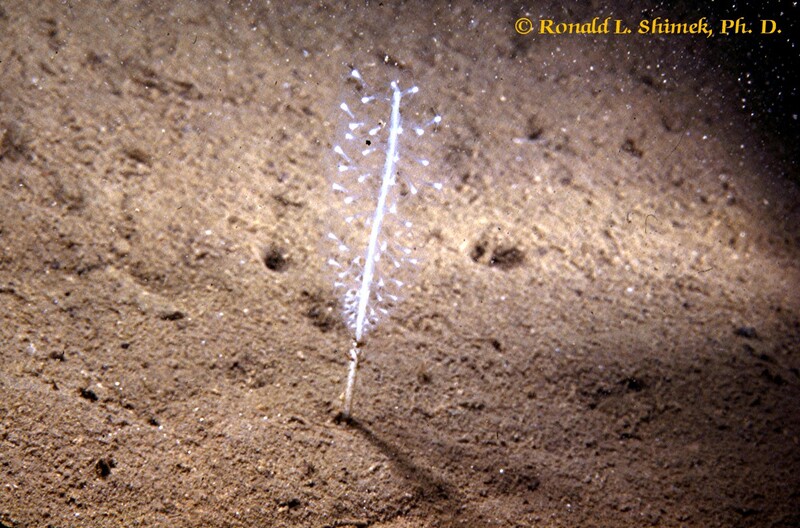 Unfortunately, these were seen during the spot surveys for determining the whole area covered by the spawning aggregation, and we could not return to them. We estimated the largest measured spawning aggregation was result of 24,000 spawning pairs of Loligo, and based our quantitative measurements of small egg mass abundance we estimated that during that one night of spawning, in the Bamfield area, over 64,000,000 squids spawned! Urticina corieaca, a sand dwelling anemone, and squid corpses. 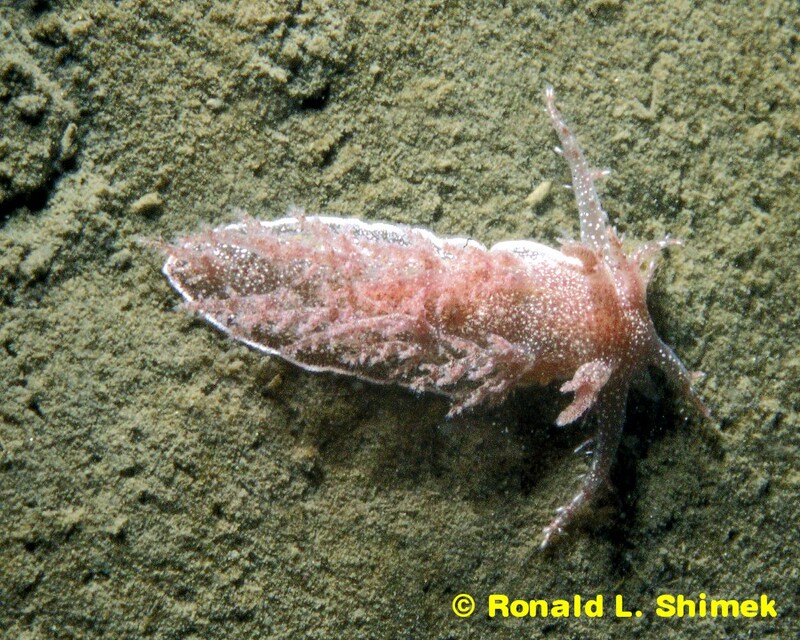 It normally would eat squid, but was sated the next morning. 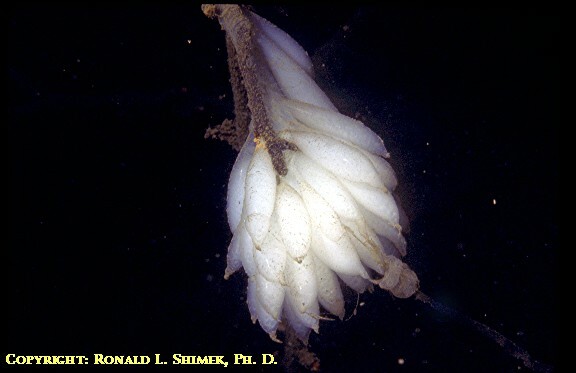 Loligo opalescens eggs take about six weeks to hatch in that region, and some of the egg masses were followed for that length of time. After hatching, the remnants of the membranous egg coverings were still noticeable on the bottom for another several weeks in places. 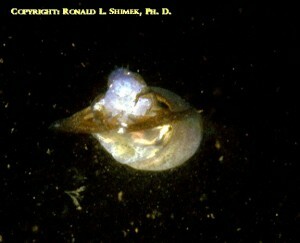 As long as the egg capsule membranes were intact, nothing was seen eating the eggs. Stupidly, I did not wear gloves during my initial examination of the egg capsules and the eggs when I was tearing and cutting open the egg capsule membranes. After a few minutes of handling the membranes my fingers lost feeling, and a few minutes after that my hands became numb and immobile. The area of numbness continued to expand until finally my arms became numb up to the elbows. It took about 2 to 3 hours before the feeling slowly returned to my arms and hands. 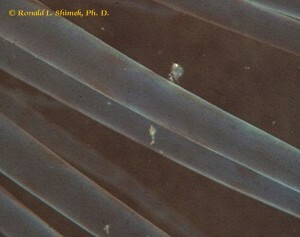 Obviously, whatever is in the membranes would be effective at deterring predation. In over 100 diver hours of examining the capsule masses, no animals were seen eating the eggs, although we saw many animals positioned on or in the masses. 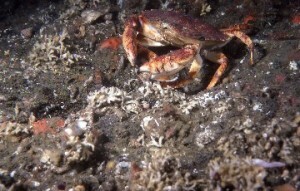 If egg capsules were torn or cut open underwater, red rock crab individuals, Cancer productus, rapidly approached and started eating the eggs or developing embryos, further illustrating the protective function of the capsular membranes. The long decay period for the membranes after the squids had hatched also indicated that the membranes contained either or both antifungal and antibacterial agents. A sunflower star, Pycnopodia helianthoides, on an egg capsule mass. The star was not eating them. Old egg capsules, near hatching. 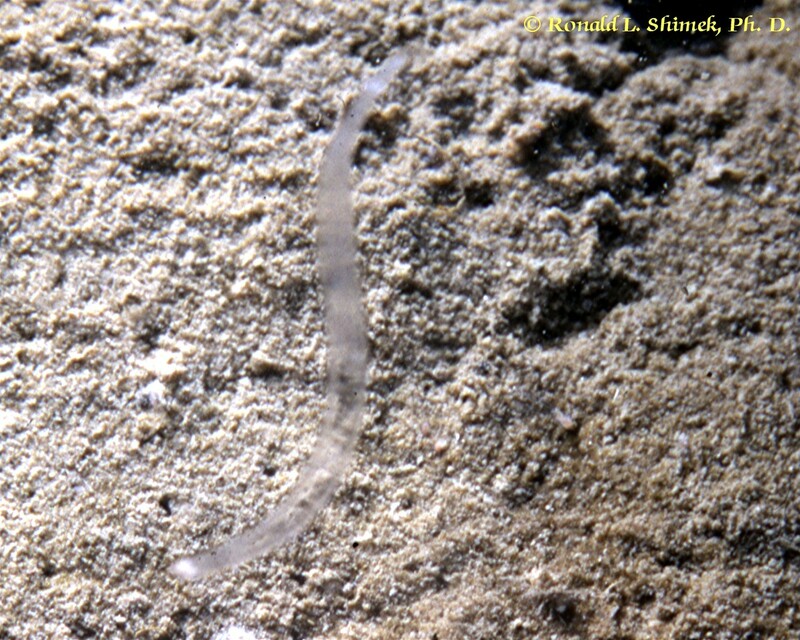 They absorb water and are about three times the size they were when deposited. 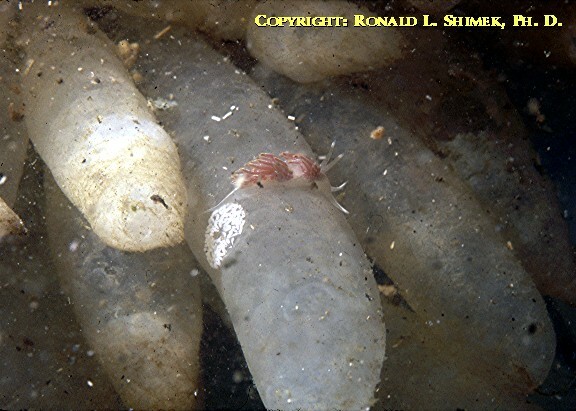 During the several weeks it takes them to hatch, other animals in the area seem to consider the toxic egg capsules as "just part of the habitat." Shimek, R. L., D. Fyfe, L. Ramsey, A. Bergey, J. Elliott, and S. Guy. 1984. 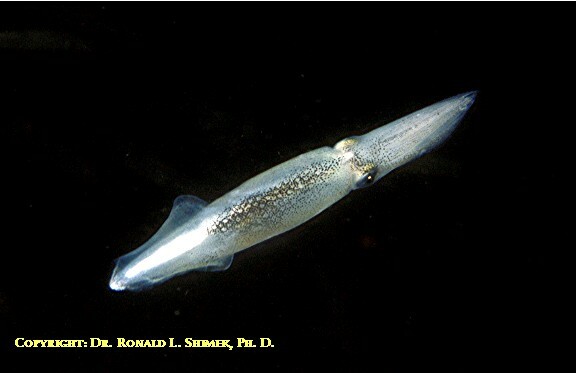 A note on the spawning of the north Pacific market squid Loligo opalescens(Berry, 1911) in Barkley Sound, Vancouver Island, Canada. Fishery Bulletin. 82:445-446.